Right from the beginning, in 1982, Lube Mobile strived to be different to an ordinary mechanic. Throughout the company's growth and evolution, to our current position as market leader, we have constantly sought to solve the traditional problems of car service and repair for our customers. 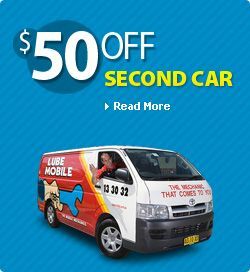 Lube Mobile today remains a 100% Australian-owned company with over 250 employees, a host of workshops nationwide and a genuine belief that taking care of your car can be easy, fast, hassle-free and very cost effective. We have served thousands of satisfied customers, and built a solid base of people who enjoy the convenience of mobile mechanical workshops for their everyday servicing and repairs, as well as for breakdowns. We pride ourselves on innovation and have set numerous mechanic industry firsts. Our online quoting system and booking process that show mechanic availabilty in "real-time" is a case in point. What is the Lube Mobile difference? Our on-site service, which saves you time, taxi fares and towing fees. Our standard 12 month/20,000km, nationwide warranty on all parts and labour. Offering itemised quotes before any work commences, putting you in control of what your repairs cost. Furnishing our vans with the full range of tools and equipment needed to perform almost any repair on site. Allowing you to see what work is being done on your car - no being ushered out of the workshop. Working 6 days a week and employing a large number of skilled mechanics to do your car service and repairs usually within 24 hours of your booking. 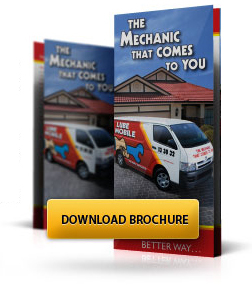 Offering full mechanical services - we organise everything for you. Keeping our prices competitive. We do not charge for travel time, only for ordinary labour time. What DOESN'T Lube Mobile do? Not ONLY a breakdown service; Lube Mobile is equipped to do all standard car servicing, non-urgent repairs and diagnostics. Your car doesn’t have to be immobile to call Lube Mobile! Not a contracting firm. Each of our skilled mechanics is an employee, dedicated to Lube Mobile's strict quality standards and trained to provide impeccable customer service. Not an automotive club - you do not have to pay yearly fees. You will only pay for the work you need. Not necessarily more expensive than an ordinary workshop. Our service represents value for money; you can factor in aspects like time savings, convenience, eliminating towing fees for breakdowns, and the confidence that our nationwide warranty will cover any problems with repairs. Check out more comments from satisfied customers on the Reviews page. Lube Mobile is a member of the motor industry association in every state of Australia, and conforms to their respective codes of conduct at all times. Find out more information about our industry association membership for your state here. Lube Mobile uses the highest quality, most reliable parts in your car repairs. Click through to see a list of the trusted brand names that Lube Mobile works with, across Australia.